What's better than freshly baked homemade cookies? 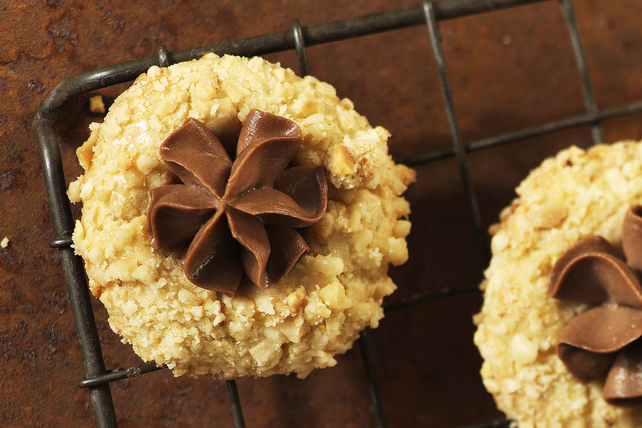 These cute little cookies, featuring the classic combo of hazelnuts and chocolate, are sure to become a new family favourite. Combine flour and baking powder. Beat butter and sugar in large bowl with mixer until light and fluffy. Blend in egg yolks and vanilla. Gradually beat in flour mixture until blended. Shape into 48 balls, using about 1 Tbsp. for each. Beat egg whites lightly. Dip dough balls, 1 at a time, in egg whites, then roll in nuts until evenly coated. Place, 1 inch apart, on parchment-covered baking sheets. Indent centres with your thumb. Bake 12 to 14 min. or until edges are golden brown. Cool on baking sheets 5 min. Remove to wire racks; cool completely. Melt chocolate as directed on package; mix with cream cheese until blended. Spoon into pastry bag fitted with star tip. Use to pipe cream cheese mixture onto cookies, adding about 1 tsp. to each. Prepare using your favourite chopped nuts. Dough can be prepared and shaped into balls ahead of time. Refrigerate up to 2 days. Bring to room temperature before baking as directed.